Edward Krasinski used line to extend his drawings into their environment, and used the drawn line to engage the participant in the space in a certain way. The effect is to draw the whole room, and everyone in it, into the artwork. “Sculptor, painter, author of spatial forms, artistic installations and happenings, Edward Krasiński was one of the most important protagonists of the Polish neo-avant-garde from the 1960s and ’70s. Born on March 3, 1925 in Łuck, in the province of Volhynia, he died in 2004 in Warsaw. Edward Krasiński’s work is a very complex, ephemeral and elusive phenomenon. Its most important aspect is the very life of the artist and his creative attitude towards reality, which is expressed through “life in art”. He constantly influenced the world with his personality, irony, humour, undermining and challenging the traditional forms of art and its meanings.” (Tate.org.uk. 2018). He describes his 1964 performance ‘Spear’ thus:Krasiński’s work is usually is represented in spatial form, often spanning large areas with having an elusive meaning. “Spears hung from the wires stretched between the trees created an illusion of movement. They were swishing [in the air]. It was all about preparing the spear to perform its function. Once prepared it could act on its own.” (Tate.org.uk. 2018). For Krasinski there were three main pillars to his work: the object, space and the beholder. He also ensured that many of his pieces had a sense of the dramatic a notion of theatre about them. In 1968 Krasinski started to use his trademark blue tape. 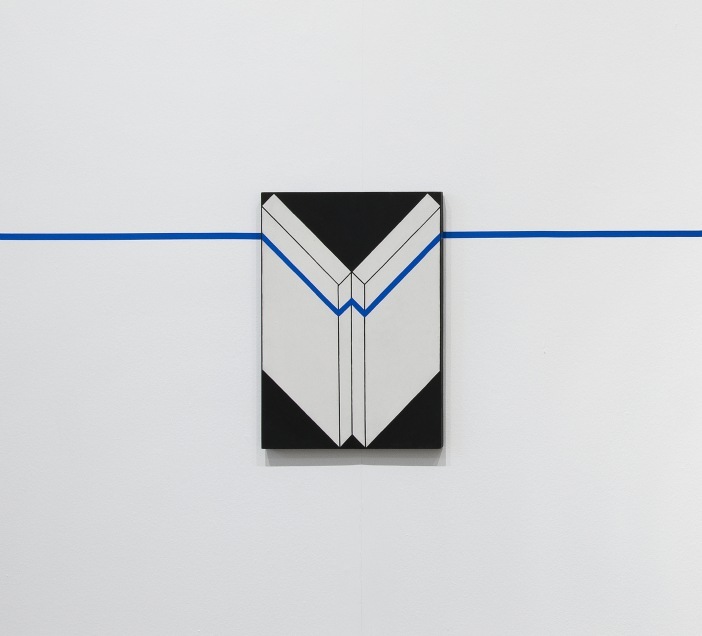 To highlight and draw attention to certain areas and define his work from the surrounding as it was not always confined to a small neat area he used tape as a boundary, to highlight it and also unify it with the surrounding space. He then started to incorporate the tape into most of his future works. It didn’t just become a unifying force and boundary tape but the work itself in many regards. He said of when he first used it: “I place it horizontally at a height of 130cm everywhere and on everything”. (Tate.org.uk. 2018). Not everyone was on-board with this extensive use of tape on his surroundings, once while at the the Musée d’Art Moderne de la Ville de Paris he taped the courtyard and the windows of the galleries. Later amused he commented, “It was like guerrilla warfare. At rue de Seine the old gallery owners went around shouting and accusing me of profaning an art site, and they called the police,’ he recalls in an interview featured in the catalogue accompanying this retrospective, but, he asserts, ‘I did not violate them. I only revealed them.”. (Frieze.com. 2018). The artwork was now the space and all it contained not just a drawing confined to a single limited bit of wall space! Tate.org.uk. (2018). Edward Krasiński Spear(1964). [online] Available at: http://www.tate.org.uk/context-comment/articles/edward-krasinskis-spear-1964 (Accessed on 26th Feb 2018).